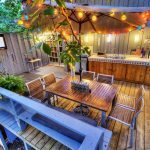 A well-designed deck is what separates a good outdoor living space from a great one. 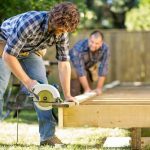 And while many of us have the DIY know-how to build a basic deck, the best way to get the deck you’ve always envisioned is to hire an experienced pro. Regardless of the direction you choose, it helps to know exactly what you’re getting yourself into before starting your project. Here’s what you need to know. Building a deck often requires a permit. Budget the time and money necessary to complete the permitting process. If you’re hiring a pro, be sure to ask him if whether he is pulling the permits or if it will be your responsibility. There are a fair amount of materials you’ll need to purchase, including: concrete, screws, stain, lighting (if required), trim pieces, balusters and decking. 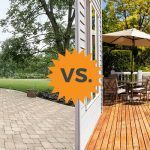 No component will affect your budget as much as your choice in decking. Most homeowners opt for pressure-treated wood, as it’s the least expensive option, yet still durable. Composite decking (Trex® is a good example) will allow you to get a deck that looks great and requires little to no maintenance, making composite decking prices well worth the cost. If you live in a wet climate, consider tropical hardwoods like cedar or redwood. They’re not cheap, but they look fantastic and are durable. Next, you’ll want to consider your lighting options. If your deck is multi-level and has steps, you might need to install lighting to illuminate the stairs. 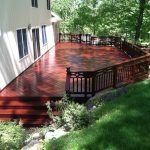 Factor in the costs of staining and sealing your deck as well as the cost of adding the finishing touches such as post caps, base trim and decorative balusters. Though a deck pro can make installation look easy, decks are composed of numerous structural components. Here are some of the most important parts to keep in mind. Joists: These components make up the horizontal frame of the deck. Footing: These underground elements support the deck’s posts. Footing is typically composed of concrete. Piers: Sort of like above-ground footing, piers are made of concrete and support posts. Ledger: This horizontal element attaches to the side of the house and supports one side of the deck. Decking: These are the boards that form the floor of the deck. Flashing: This protective layer prevents water from seeping in where the deck connects to the outer wall of your home. 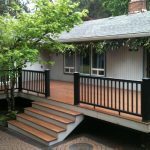 A deck pro can build a standard deck with railings and a staircase in one to three weeks. Decks with complex designs can take an additional week or more to complete. Occasionally, advance preparation like grading or significant foundation work can add more days to the total timeline. Though decks can be straightforward constructions, most plans and designs vary significantly. Most deck pros offer planning services, but most require extensive homeowner input. Whether you want to design your own deck or you just want to get an idea of the possibilities, an online search for deck plans will produce countless results. Keep some of the following elements in mind when planning your deck. Material: Wood, vinyl and composite are some of the most popular materials for decks. Shape: Decks can be rounded, rectangular or any combination of the two. Railings: Go with standard wood, or opt for a contemporary material like metal, glass or cabling. Levels: Many decks encompass just one level, but if you have significant height to work with, there’s no reason your deck can’t extend to two or more levels. Stairs: Go with a straightforward railing, install a spiral staircase in a small space or opt for a ramp instead. Enclosures: Decks can be uncovered, partially covered, completely covered or even enclosed or screened. The cost of building a deck varies depending on the material you choose, the complexity of the deck, size, the amount of construction involved, and your location. Check out our deck cost calculator to prepare and budget your project. Different contractors may charge different rates, so be sure to get at least three estimates so you can be sure you’re getting a fair price. The cost for a standard deck that measures about 120 square feet averages $1,500. More complex decks cost $5,000 or more, and multi-level decks that span hundreds of square feet can cost over $20,000. Keep the tree by simply adding extra framing around the tree and make it a part of your deck. Be sure to allow for future growth. Don’t use the tree as a structural support. For graded areas, you’ll either need to use longer posts to level the deck or consider cantilevering the rim joists by using a steel substructure. This provides a great architectural feature, but you’ll need a structural engineer or contractor to determine what’s safe and meets code. 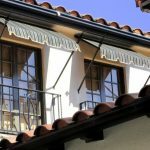 Maybe you’re installing over an existing patio or a concrete porch. Modify your design plans and the steps above to accommodate any existing structures. 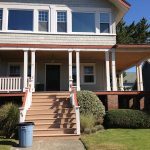 In most cases, you won’t need to do any demolition, but it’s possible. Consult a professional for any necessary modifications. Also, be sure to avoid using the concrete or patio as load bearing footers without first checking to see if they can support the weight of the deck. To simplify this down for a DIY deck, you’ll need to simplify the design. 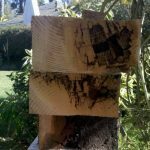 You will probably want to avoid attaching it to your home with a ledger board. Keep the footprint a square or rectangular shape. To really keep costs down, simply make it smaller – consider a two-phase plan with a small deck to start and an addition later. Tall and large decks tend to have more posts and added architectural features. Second story decks will often have a full flight of stairs and should be stained on the bottom side. Since large and tall decks both tend to take weeks to construct, it’s usually best to let a professional handle this job. Tall decks need additional scaffolding, ladders and safety equipment. The best way to make either a tall or large deck is to hire a professional. When you seek out a deck pro to build your outdoor space, be sure to look for one with plenty of experience managing a variety of deck-related issues. Decks can get complicated, especially if you prefer a complex layout or your yard presents landscaping challenges. Ask any deck pro you’re considering the following questions. Are you insured? 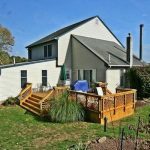 While you don’t want to anticipate anything going wrong with your deck construction, you certainly don’t want to encounter an expensive problem down the road. Be sure to ask for details about the contractor’s insurance coverage and even request the name of the insurance carrier so you can better understand the policy. Who will do the work? Deck pros may have employees do the majority of or contract jobs out to specialized subcontractors. Make sure you know not only who will perform the work but also who will be in charge of any on-site contractors. Can you provide me with references? Talking with contractors’ previous clients is the best way to understand how they works and whether their completed projects satisfy clients. If a contractor can’t or won’t provide you with references, get a second opinion by looking him or her up on contractor review websites. Does the estimate reflect the total cost? Decks can be complicated construction projects, and estimates don’t always reflect every aspect of the construction and cleanup. Contractors often leave permit costs and cleanup costs out of estimates, so make sure everything is accounted for when you read over the quote. Building a deck is a great way to improve the look of your home and the quality of your outdoor living space. And while it can be a straightforward project, in many cases it’s best to hire a licensed pro to tackle the job for you. A pro will be able to identify the best plan for your needs, pull the necessary permits, and deliver a finished product that meets or exceeds your expectations. Ready to get started? We can help you find the pros you can trust to get the job done right. Should You Build a Deck or Hire a Pro? Great post!! Everything is explained in a proper and easy way. But sir do you think that we should call a professional for any of our deck construction work? ?